Ann has never been a rulebreaker, but she’s fed up with corporate control and allows some light-hearted rebellion to creep into her life. But, as a horrifying accident occurs and her family falls apart, she realises that taking destiny in her hands may have had unforeseen consequences. 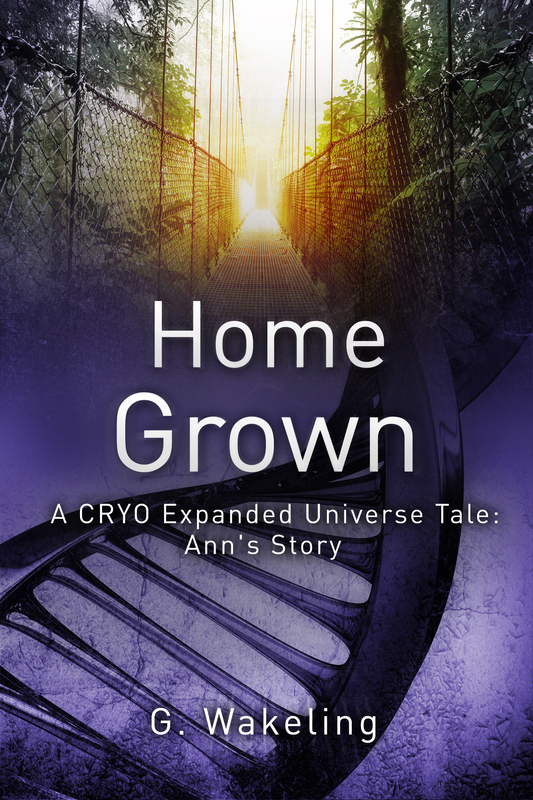 **Home Grown is a short story detailing cryonics candidate Ann Werdwenen’s life before CRYO. For the full stories, dive into the dystopian mystery of CRYO: Rise of the Immortals and CRYO: A Changed World. Ann heard her wife rustling in their duffel bag and soon enough, the cold hard metal of the cutters landed in her hand. They were industrial looking things; not easy to come by, and she studied them for a moment, realising they were about to go past the point of no return. But stopping now and preventing themselves from breaking the law wasn’t as simple as making a cowardly exit. There was more at stake. She kept her momentary hesitation to herself, knowing that Karena, though aligned with the same principals, wasn’t quite as keen about taking such strong action. Especially since the two women, in their mid-forties, both had respectable jobs and respectable friends and should never be doing such a thing as this. So, instead of voicing her thoughts, she put tool to fence and began to steadily snip through the thick wire. It took longer than expected to create the sizeable hole they required. It didn’t help that they were precariously perched on the building’s 102nd floor with nothing between them and a descent to certain death. Their cover could be blown at a moment’s notice by any number of the thousands of residents who lived in the towers around the sky farm. Ann had picked a cloudy and windless night on purpose; it was safer this way. But now she was on the perilous ledge with Karena by her side, Ann was chilled not only by the still night’s air. “Almost there,” Ann muttered, taking a moment to turn and reassure Karena. Her wife looked nervous, fearful even, and Ann reached out to comfort her. “We’ll be in and out in no time,” she promised. With one last snip, she finished her roughly cut door in the fence and used a few quick kicks to bend it open. Then she and Karena crawled through, before pushing the wire back into place so their intrusion wasn’t instantly obvious. The women were able to stand without fear of being swept off the thin ledge now, and Ann allowed herself to stretch and take in their surroundings. They were standing at the top of – on top of, in fact – a sky farm not far from home. There was one in their own district, but it seemed a little less idiotic to raid somewhere further afield. The top of the building had a large and transparent dome similar to that of the city’s Sky Parks. However, unlike those recreational locations, the sky farm’s ceiling served only to collect as much natural light as possible and funnel it down into the building to add to the artificial illumination provided to both plants and animals day and night. With their safety better protected, Ann and Karena scurried around the circumference of the dome, keeping to the darkened shadows and glad of the cloud-covered sky. They’d not had a lot of time to do much reconnaissance of the area, but she was relieved to note a lack of cameras. ­They probably don’t expect anyone to ever come up here. The building’s maintenance hatch was easily found, and she gave it a hopeful tug. Unsurprisingly, it was locked. “Hand me the torch,” Ann muttered, taking the light, turning it on and wedging it into her mouth. Then, taking the bag from her wife, she began to rummage through the contents as quietly as possible, silently cursing as equipment clinked and clanged. Finally she found what she was looking for and drew it aloft with a look of joy. Ann stood and pushed the key into the door, her eyes gleaming in the darkness. She turned it gently, listening as the locking mechanism clicked. Then she gave the entrance a gentle push and watched as the door swing open. Ann hesitated. It was true, things had spiralled a little further than even she had imagined. A quick and light fingered pilfering spree had turned into breaking and entering. But they were here now. They couldn’t go back, could they? But without Karena onboard, Ann wondered whether she could continue. Her love seemed to realise the fact, and though having paused moments earlier, now grabbed the bag from where Ann had left it on the ground and stepped through the doorway. She pulled the torch from Ann’s hand and the light began to dance on the walls as she descended the stairwell. Ann followed, drawing the door to a close but not clicking the latch just in case they need a swift but silent getaway. After several minutes of spiralling downwards in the thin corridor that curled around the dome like a snake, they came to a thick and sturdy door. This one wasn’t locked, but it was heavy, and it took the two women all their strength to open it. As the first crack appeared, bright white light gushed through the opening, flooding their faces with colour. Ann looked to where Karena was bathed in the illumination, studying the thin lines at the corner of her eyes, the way her brow furrowed with focus and the pale blonde hair which showed no signs of age. Beautiful. The moment ended as the door was swept open further, and Ann looked past the love of her life and into the sky farm’s core. The two women scurried across the room, ducking under the vines of tomatoes that were held aloft in hydroponic guttering. Each plant spewed over the edge, the tiny green and ripening fruits hanging down like Christmas baubles. Ann couldn’t help herself, and she plucked one of the riper fruits as she ducked beneath the vegetation. Without hesitation she popped it into her mouth and bit down, feeling the squelch as seeds and juice erupted. “Oh God. Karena, you have to try these,” she murmured in ecstasy as she looked around for another ripened delicacy for her lover to devour. Karena’s hand was on Ann’s arm, drawing her away from the ripening vines and across to the doorway in the wall. She was right, of course, so Ann abandoned searching out another bright red gem and followed Karena towards the door. The smell of the place was something she’d never experienced. The tingling sensation of fresh fruit was still in her mouth. It was so unlike the bleached, unflavoured tomatoes she was used to. It was almost unrecognisable. In its pure form, in this genetically-modified base construct, there was actual texture and potency to the flavours. Once it left the building and arrived at the suppliers, it would be ruined with protein stabilisers, chemical flavourings and longevity serums; those tomatoes might last for weeks, but they sure didn’t taste like this. And the smell…..it filtered into Ann’s nose again. She’d never known tomatoes had such a distinguishable perfume to their leaves. Looking up, she saw Karena was standing in the open doorway watching her every move. There was a smile on her face, their eyes met and when Ann reached the doorway, she kissed her. “And that is why I’m here right now. I think I’ve lost my mind,” she replied, before grabbing Ann’s hand and pulling her down the stairwell. They left the bright illuminations of the sky farm’s top tomato level and descended the floors. As keen as Karena was to get a move on, Ann snuck a glimpse through the door at each stage. ‘Strawberries,” she uttered in delight, craving to taste yet another delight but knowing they didn’t have time. A field of bright salads followed, luminous green and curly red leaves reaching towards the artificial lights above. “What are those?” Ann asked, hesitating at the door of the next level and looking out at the mounds of earth and deep green leaves poking above the surface. “Potatoes,” Karena replied, pulling Ann’s face away from the door and kissing her. “We haven’t got time for this,” she said, repeating her concerns and continuing their downwards plight. She tried the handle and was amazed when it opened and spewed frozen air onto the stairwell. Karena rolled her eyes, before grabbing Ann once again. Karena was across the threshold already, drawing Ann with her and ensuring the door was closed behind them. Inside, as the initial escape of air had suggested, it was absolutely freezing. Immediately, tendrils of breath began to spiral before her lips, and the chill on Ann’s hands caused her skin to pin-prick. Should’ve brought warmer clothes, she thought, realising that as much planning as she’d done, she hadn’t factored in the giant seed freezer’s temperature. As they moved along the icy shelves, the sensor lights above them flickered on, illuminating the thousands of seeds within their grasp. She couldn’t even believe the vast size of the room, the hundreds of thousands of seeds on display; it was more than she could have ever imagined. She looked across the shelf she was currently perusing and saw each seed was individually contained within a thin, transparent film of plastic. She’d never realised they were so different from one another. Here, bean seeds were large, speckled and kidney shaped. On the opposite side she saw tiny seeds no bigger than a pinhead; salad crops, apparently. She reached out and felt the frost on her outstretched arm. Gee, it really was cold in here. Ann stowed a few salad seeds in her pocket, pushing them inside the pencil-case shaped cold storage unit they’d brought. Ahead, Karena was rushing down the aisle, her hands full of packets, her eyes filled with urgency. She pulled open Ann’s pocket and shoved more seeds into the storage case, before pressing the edges of the gel together to seal it. “I don’t know why you get so frenetic,” Ann replied with a small roll of her eyes. Ann realised the only way to shut her up was to kiss her, so she locked lips with Karena and pulled her in tightly, enjoying the additional heat against her skin.